These days, frying is off the table at our house most of the time because Bob and I have to think about our waistlines. But every now and then, I like to give my iron skillet a workout. That's one reason I wanted to fix this lightly battered delight from Junior's Home Cooking (Taunton Press, October 2013, $24.95). 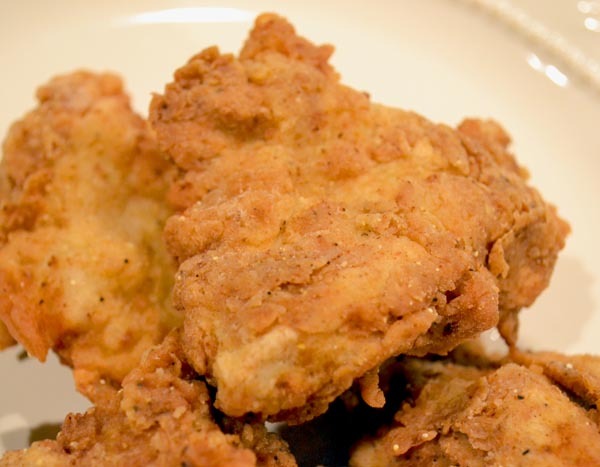 Using cornmeal in the breading gives this fried chicken a delicious golden color and crunch. One of the top stops for comfort food in Brooklyn, NY, Junior's is on our must-try list (their cheesecake has been called the best in New York!). We live in Texas but visit Brooklyn as often as we can because our son Cole moved there about two years ago. And cooking this crunchy chicken at home is the next best thing to being there. What's the secret to making Junior's mouth-watering fried chicken? Allow yourself plenty of time. Start to finish, it took me about an hour and 30 minutes to prepare half the recipe below. Why only half? It makes four generous servings, there were only two of us and freezing leftovers isn't recommended. Both the dipping batter and the breading contain several seasonings and yellow cornmeal. Using cornmeal in the breading reminds me of making fried okra and gives the chicken a delicious golden color and crunch. You'll need eggs, whole milk (forget using nonfat or low-fat stuff here), flour, cornmeal, kosher salt, baking powder and black pepper for the batter. Whew, that's a lot more than the standard milk-and-egg bath and you can taste the difference! Once you mix up the batter, let it sit about 15 minutes. Meanwhile, make the breading using flour, yellow cornmeal, fried chicken or Cajun seasoning, dried thyme, paprika, kosher salt and black pepper. This mixture yields a coating akin to Chick-fil-A's spicy crust. Yum! But the amount of heat is up to you. I upped the Cajun seasoning by 1/4 teaspoon and might add more next time because we just love a little kick! There's more to this batter than the standard milk-and-egg bath and you'll taste the difference. To complete this tasty dish, you dip the chicken pieces (I used boneless breasts) in the batter, roll them in the breading, put them in the fridge for about 15 minutes then cook in a large frying pan. Got an iron skillet? That's even better. Although the chicken cooks quickly, you can place only a few pieces in the pan at once if you want a crispy crust so be prepared to make several batches. You can use any large frying pan but an iron skillet works best. Afterwards, thanks to the tips from this Brooklyn institution, we enjoyed some of the best southern fried chicken ever. Golden, crispy on the outside, juicy on the inside, this fast favorite was wonderful served hot with a dollup of cream gravy (Bob's choice) or Heinz 57 Sauce (my go-to). Either way, you're guaranteed a hit with the pickiest eaters! Place the boneless breasts or thighs between sheets of wax paper and, using a meat mallet, pound them out to 1⁄8- to 1⁄4-inch thickness. If using chicken pieces, set them out. Sprinkle both sides with as much salt, pepper and Cajun seasoning (if using) as you like. 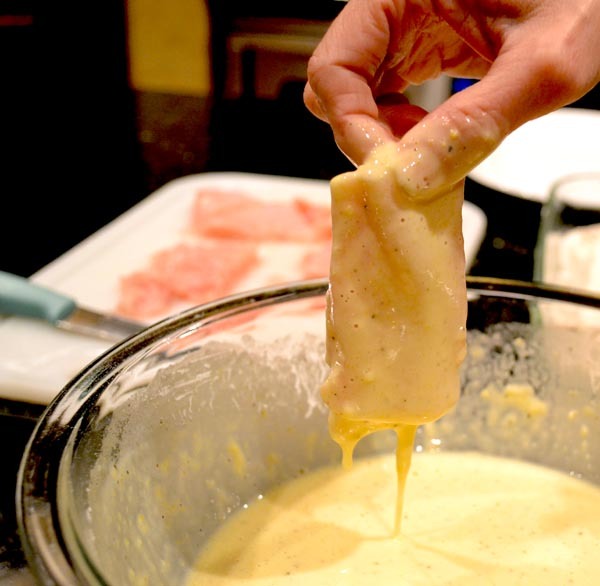 Make the dipping batter: In a large bowl, whisk the eggs and milk together until frothy. Add the remaining batter ingredients and whisk until blended and smooth. Let stand for 15 minutes. Meanwhile, mix all the breading ingredients together in a shallow baking dish (a 13 x 9-inch one is perfect). Working with one piece of chicken at a time, dip first in the batter, letting any excess drip back into the bowl, then roll in the breading, coating it well on both sides. Transfer to a tray and continue until all the pieces are coated. Refrigerate for about 15 minutes, until the coating is set. Meanwhile, in a large frying pan (use an iron skillet if you have one), heat 1 inch of oil over medium heat until hot but not smoking, 325° to 350°F (no higher, as the oil can break down and burn). Gently slide the chicken into the hot oil. Cook only a few pieces at a time; otherwise the temperature of the oil will drop and the coating will absorb oil instead of frying up crispy. And remember, avoid overcrowding the skillet, because each piece needs its own frying space to cook evenly. Cook the boneless chicken, turning only once, until golden and cooked all the way through, 3 to 4 minutes per side for boneless breasts and 4 to 5 minutes per side for boneless thighs. Cook the bone-in pieces for 8 to 10 minutes total for white meat, 12 to 13 minutes total for dark meat. The bone-in pieces of chicken are done when the juices run clear at the thickest point at the bone. Between batches, if you need to add more oil, carefully and slowly pour it down the side of the skillet and wait until the oil comes back to frying temperature before adding the next batch of chicken. Drain the cooked chicken on a wire rack (not on paper towels). The chicken is best served while still hot, but is still delicious at room temperature. If there is any chicken left over, refrigerate in a zip-top plastic bag and enjoy the next day. Do not freeze. If you've always wondered how to batter and fry delicious Southern fried chicken, this is it. 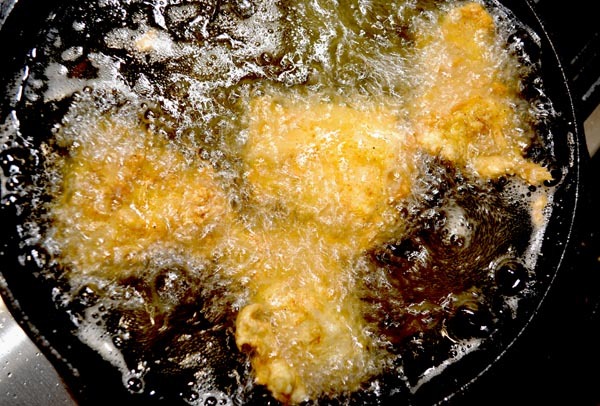 Be sure the batter is thick, but not too thick or it will fall off during frying. Watch the batter closely. It can thicken as it stands, so add a little extra milk if you need to. 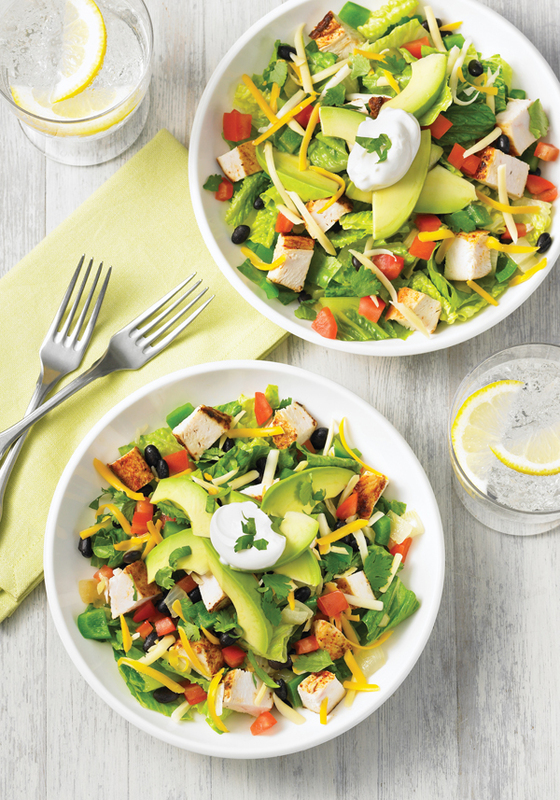 What's Inside: More than 115 customer favorites from Brooklyn's Junior's restaurant adapted for easy preparation in home kitchens. You'll find everything from starters (think Deviled Eggs) and sides (like Junior's Macaroni & Cheese) to main dishes (yummy Bar-B-Q Baby Back Ribs) and desserts, including Junior's award-winning cheesecake. 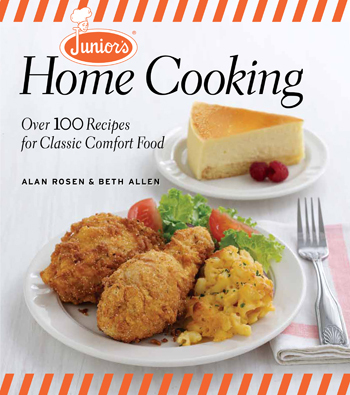 Packed with ideas for everyday as well as special occasions, this comfort-food collection includes tips for making each dish "The Junior's Way" as well as suggested menus for entertaining. Perfect for Baby Boomers, most of these classic recipes have been popular since Junior's opened in 1950. * Excerpted from Junior's Home Cooking © 2013 text Allan Rosen and Beth Allen; photography Mark Ferri. Reprinted with publisher permission.